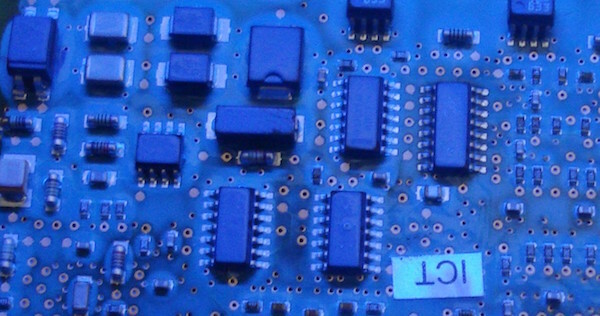 The process properties are defined for the conformal coating material whilst it is used in the application process. So, it is still in its liquid state but being applied in the various means. Wetting is the ability of a liquid to maintain contact with a solid surface, resulting from intermolecular interactions when the two are brought together. The degree of wetting (wettability), is determined by a force balance between the adhesive and cohesive forces. In terms of conformal coating the wetting to the surface of the circuit board is extremely important. This is certainly the case when the circuits are not cleaned before coating which can be the case in high volume electronics where cost of production is important. The opposite of wetting, de-wetting, is a defect that can cause a lot of process and final inspection problems. When considering wetting you have to consider surface energies and surface tensions. When a coating has a low surface tension (a typical conformal coating does have low tension) and a substrate (circuit board) has a high surface energy then you have good wetting. When a coating has a high surface tension (a water based conformal may have a higher surface tension unless additives adjust this) and a substrate (circuit board) has a low surface energy (for example a dirty no clean circuit) then you may have bad wetting, or de-wetting. Capillary action (sometimes known as capillarity, capillary motion, or wicking) is the ability of a liquid to flow into narrow spaces without the assistance of, and in opposition to, external forces like gravity. Generally, some capillary under components is good when using conformal coating. Coating the underside of devices can aid the protection of the circuit itself. However, completely under filling devices like Ball Grid Arrays (BGAs) is definitely not ideal as CTE mismatch between coating and component can lead to damage to the device. Also, in terms of conformal coating the capillary effect can influence the way the coating flows (levels) across the circuit board and can influence the uniformity of the coating thickness. We have already defined the viscosity of the liquid itself when in its liquid state before use in production. However, viscosity can also be a first order influence in production. This is because viscosity affects important factors such as the coating thickness, the flow of the coating, its ability to wick / capillary across the circuit board. A more viscous coating will not flow or level as much as a low viscosity coating. This is true in conformal coatings. Also, some processes will not work with the incorrect viscosity. With all other factors controlled a significant change in viscosity can lead to a completely different coating coverage (too much flow or not enough), leakage into connectors via capillary and the wrong coating thickness. Therefore, controlling the viscosity is of paramount importance. 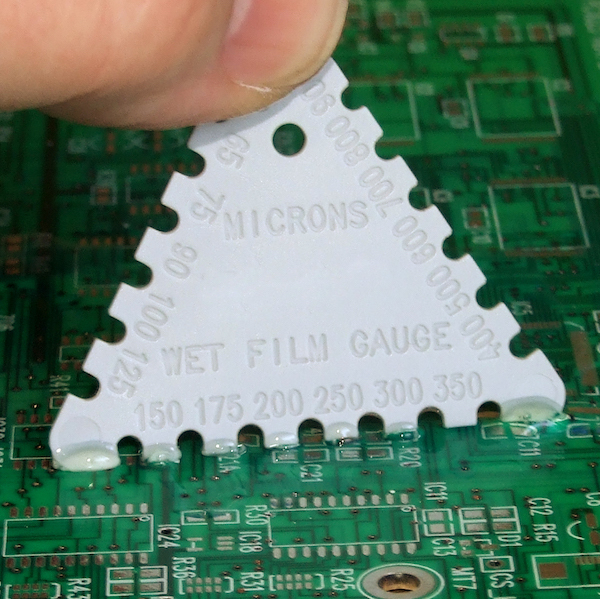 The wet film thickness is directly related to the solids content of the conformal coating. A conformal coating is made up of two parts, the volatile and non volatile materials. The non-volatile part represents the solids content of the coating. When a solvent based coating is readied for spraying through a spray gun then the solids content can be between 10-20% depending on the material type. This also means that 80-90% of the coating is volatile and wasted! When comparing materials it is certainly worth considering the solids content to ensure you are buying a similar amount of usable resin / solids content and not purchasing solvents which add no value to the protection of the circuit board. The tension of a liquid is caused by the attraction of the particles in the surface layer by the bulk of the liquid, which tends to minimize the surface area. Surface Tension effects on a circuit board can lead to conformal coating defects like Capillary action. It can also determine if the conformal coating wets the circuit board completely or puddles up and does not effectively protect the PCB. The Pot Life of a conformal coating is different to the Storage Life. Storage Life looks at the coating in its container when it is sealed. Pot Life is the usble time of the material when in production. Once again it is dependent on many factors. This includes but is not limited to the chemical design of the material, its cure mechanism and the ambient conditions the coating is used in production. The most significant factor tends to be either solvent evaporation or the cure mechanism. If the coating is a solvent based acrylic material then the controlling mechanism is the evaporation of the solvents. This in turn leads to a change in viscosity. This leads to a change in process control. It is important to note that the evaporation of the solvent can be corrected by diluting the coating with thinners to reach the original, optimum viscosity range. If the coating material has a cure mechanism like moisture or oxidation cure then this will also change the properties. This includes viscosity. However, the key difference is that the process is normally irreversible and once curing starts it tends to mean the end of the material in the pot. Meeting the Manufacturers recommendations on the Pot Life should be the aim to ensure the maximum pot life is achieved. 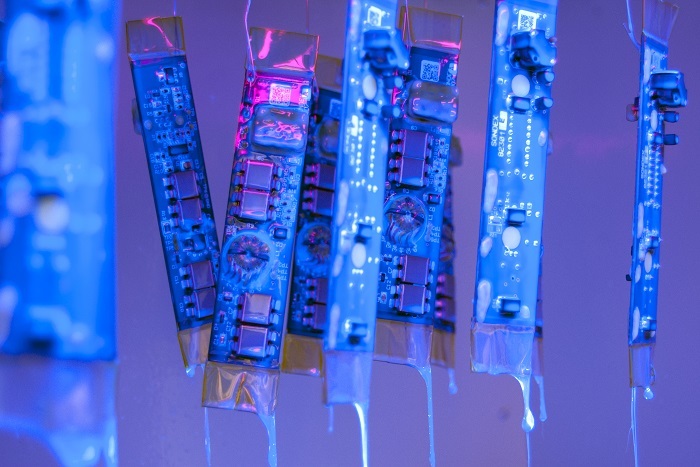 Drying and Curing are very important when considering the processing of a conformal coating. Circuit boards drying after being dipped in a solvent based conformal coating. They do not actually cure. Drying is a property a solvent based conformal coating shows. This means the coating can actually be re-dissolved back up in the evaporated solvents and reform the coating. Other conformal coatings actually cure. That is they cross-link by one of the many available methods heat, UV, moisture and catalysed cure. Factors that influence drying include the solvent evaporation rates (their boiling points), the ambient conditions around the drying the circuit, the wet film coating thickness and the extraction rate / air flow around the board.